Guitar pro discount step 1. Guitar pro discount step 2. Remember that you need to become a premium member to receive the coupon. Membership packages start at $1, so it's a no-brainer actually. 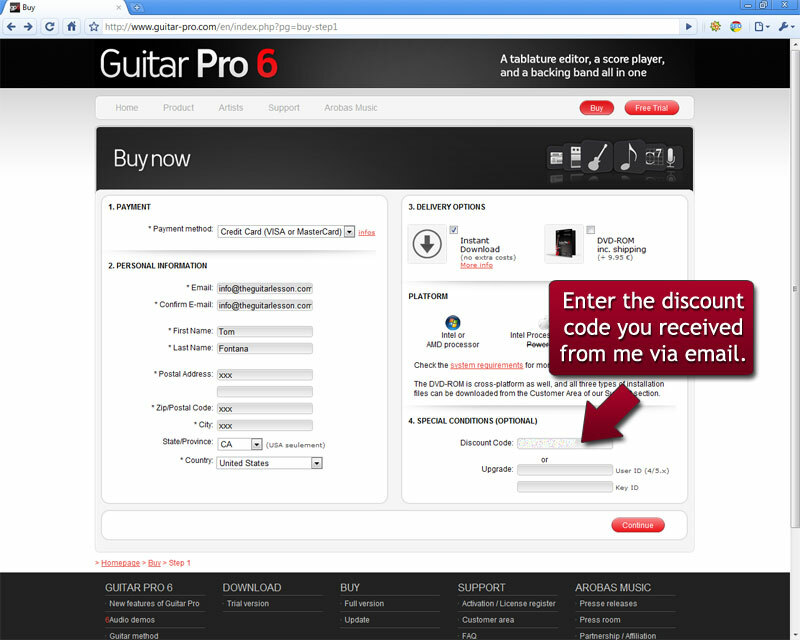 You'll receive your discount coupon with your registration e-mail, entitling you to 20% savings on Guitar Pro. To validate your coupon, click the banner below and follow the above instructions. If you are on the lookout for more advanced online video guitar lessons, you might want to read our JamPlay.com vs GuitarTricks.com comparison. If you decide on either one, you'll be glad to know that you can save a couple of bucks on both memberships with our JamPlay coupon code or the GuitarTricks discount coupon. What is Guitar Pro 6? and many more useful things that would be too long to list here. I kid you not when I say that GP6 is pretty much the only piece of guitar software I ever use. Not because there aren't many others, but because GP6 is so complete in every respect and works well each time I start it up. The only area where they could maybe improve a little is their customer support, I sometimes hear people complaining that their support reps are a bit slow to respond. I for one have never had anything go wrong, so never had to contact support in the first place. If you want to check out GP6 in person, have a look at the tutorials I created not long ago. You'll get an overview of the most important functions of Guitar Pro 6, as well as find out where you can download all the GP6 tabs you could ever ask for. And remember, if you decide to purchase GP6 and you are a premium member at TheGuitarLesson.com, you get to save 20% off the price of the software when you enter our exclusive GP6 discount code. What is the cost of the soft ware? Is the same guitar pro 6 that works in unison with a Firelight guitar? Hi there, it’s in your sign up email. It might be in your spam folder, please check it there. If not, send me your email address via the contact form, and I’ll send you the code. The code is in your sign-up email, maybe it went to your spam box? so i got the subscription email but no code… i dont know if i missed it or just didnt get it. can you send me an email with just the code? its just all very confusing. 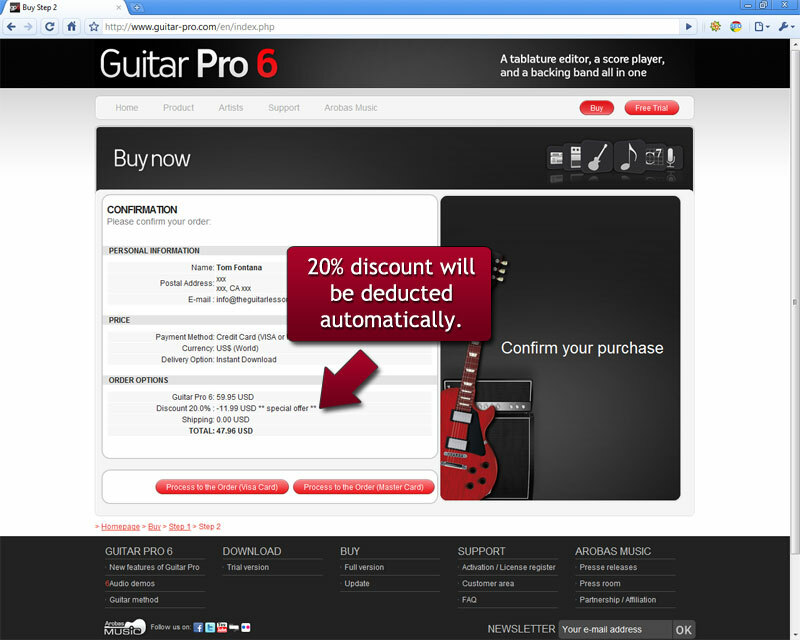 Hi, the 20% off on Guitar Pro 6, promotion is still availeble after becoming the premium member.? Yes, there is a new code. The one you used was for GP5, I’ll send you the new one for GP6. I am a premium member and I tried to get 20% off on Guitar Pro 6 and put in ‘fontanna’ in the discount code and it didn’t work. Is there a new code for this? Thanks! Also will you be doing the guitar lesson on the last part of Stairway to Heaven? Good news everybody, our code is working for GP6 as well. The code itself has changed, so if you are a premium member at THeGuitarLesson.com, send me a letter with your username, and I’ll send you the new code. I just tried to use the code and it is still not applying the discount. Any status? Any news regarding the coupon code? Any idea on when the coupon will be vaild? Seems like it should be working by now. Hi, at present, the code is not working due to the switch to GP6. The publisher of the software said they would email me once the code starts working again, hopefully soon. Hi! Is the coupon code good for the new Guitar Pro version 6? Thanks! Wow, I found it 🙂 Thanks! I’m guessing the code isn’t working with GP6, but I’ll ask them about it. Hi, it’s available through a link on their facebook page a few days early! On the “Arobas Music – Guitar Pro” page. The demo is available there too…it’s sweeeet. GP6 has not been released yet… Where did you try to buy it?? The discount code has expired again. Revalidate it, please. Hi, does this only work with GP5? Just signed up and tried to use the code to buy GP6 and it doesn’t seem to apply any discount. Disregard previous, sorry. Discount code works fine. The discount code for Guitar Pro is invalid. Cool, this is like arbitrage. Spend $1 to save $17. Got the code and worked as promised. Great video tutorials as well, but too simple for me, I’ve been playing for 7 years. Sorry, the code expires every couple of months, but I got it revalidated again, so it should be working now. Something is wrong, the code says expired. I actually decided to remain a member at Tom’s site, the video lessons are really helpful, I’ve only been playing for a couple of months. Thanks, got it in email right away after becoming a site member, and worked perfectly as described. I registered for the 3 day membership but I haven’t gotten a discount code yet. Sorry about that, I just sent you an email with the code.